Sean Spicer was really hoping to enjoy St Patrick's Day, but that was proving difficult. The US Press Secretary earlier this year singled out the Taoiseach's visit to Washington as one of the events he was most looking forward to at the White House, now he is on the inside. He's proudly Irish-American, fond of a pint of Smithwicks when good Guinness isn't available, and not adverse to wearing green-and-white shamrock trousers at this time of year. But here he was, eyes defiant, chin out, again angrily confronting members of the press as things got pretty heated in the daily, televised live White House press briefing, the dark green tie fooling no one into thinking he was enjoying the day. The 45-year-old at one point snapped at a member of the press to "Calm down! ", though it was Mr Spicer's voice that was hitting the higher pitch, before he launched into a monologue that did little to address the issue at hand. That latest issue (if it actually matters) was the news that a US Senate Intelligence Committee had rejected Donald Trump's claims - made on Twitter, naturally - that the Obama administration tapped his phones during the 2016 US presidential campaign. "He stands by it!" Mr Spicer insisted, backing his boss resolutely. But then he has become world-famous in just a few weeks through backing his boss resolutely, and often, critics of both would say, defending the indefensible. It was tense, confrontational and the pointed questioning, answering and sniping continued for about a half hour - Mr Spicer versus CNN, Mr Spicer versus ABC, Mr Spicer versus semantics - before he wrapped it up, mopped some sweat off his brow and went to the Oval Office for a debrief with Mr Trump. 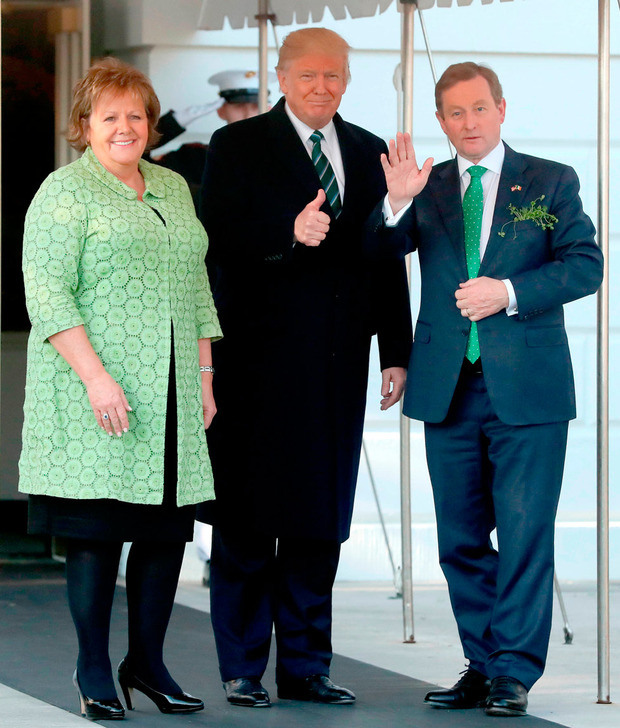 A short time later, the 45-year-old was in the East Room of the White House as Enda Kenny handed over a bowl of shamrock to Mr Trump. "Hello Sean, Senator Fitzgerald from Wisconsin," a middle-aged Republican politician said bounding up, grabbing Mr Spicer by the shoulder and requesting a picture. "You're my hero, what a job you're doing." St Patrick's Day at the White House for Mr Spicer, you feel, wasn't much crazier than any other day here. Are they making it up as they go along? 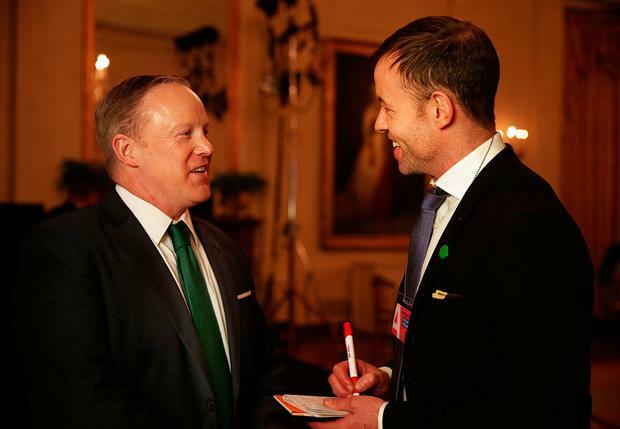 "It's going great," Mr Spicer insisted to the Irish Independent, when asked about his high-pressure role as the man tasked with keeping the media, real and 'fake', vaguely on message. The Rhode Island native, whose great grandfather was from Kinsale, was more bullish again when asked about the first meeting between Mr Trump and Mr Kenny earlier in the day. "Oh, they hit it off phenomenally, just phenomenally in the Oval Office," he said. "I think and hope it's just the very beginning of a long and fruitful relationship." Relentless positivity is, of course, another cornerstone of the new administration. You could argue relentless negativity is another. Just getting through each day is, presumably, a third. According to one junior member of the White House staff, a recurring question for the Trump administration in the two months since inauguration is: "Well, what did we do last year?" That ensured the luck of the Irish was in on Thursday. But maybe Enda shouldn't read too much into it. "Well, if you think about it, the Irish spent seven years getting Mr Obama to that level of engagement on St Patrick's Day, in terms of the breakfast with the VP, the Oval Office, the lunch on Capitol Hill and the shamrock ceremony back in the White House," the staff member said. "Mr Obama's first St Patrick's Day was much more low-key, but Mr Trump has started at the level where Mr Obama finished. "There have been 12 state visits since Mr Trump took over, and some have been 45 minutes. But he has attended three separate events with Mr Kenny - it's unprecedented that he'd give over a full day like that." Angela Merkel should be so lucky. Whether Mr Trump's scheduling was due to copy-and-paste or some previously well-hidden goodwill or plan for Ireland is not immediately clear. Mr Spicer wasn't shedding any light on it if, indeed, he knew. Does Mr Trump want a friend in Europe after all? Or is another potential lapdog of some use? Given the desertion by Irish-Americans of the Democratic Party in the election targeting that constituency seems relatively pointless. Not that it stopped Vice President Mike Pence. "If I hear that story about his 'Irish' mother with the red hair and blue eyes once more..." one commentator grimaced at the breakfast with Mr Kenny on Thursday morning. It was rolled out again with the shamrock 10 hours later. To be fair, both set pieces passed off calmly, if not without cringeworthy Oirishness. The photo opportunity in the Oval Office ahead of the bilateral meeting was more in keeping with the often-chaotic nature of the administration readers of say, the "failing" 'New York Times' might be familiar with. "The press was due to go in after the meeting but Mr Trump said 'get them in' and there was that mad rush, journalists getting hit by cameras, jostling, just crazy for a simple photo op," an insider said. "He wanted to get it out of the way." Mr Spicer's team was helping to look after 25 Irish media and 12 American. It was a 90-second free-for-all. The Irish contingent was soon inviting the president to Ireland, jumping in with questions before the Taoiseach - in all probability - had gone beyond the pleasantries. "I love Ireland, I'll be there for sure," he answered. However it came about, there is no doubt Mr Spicer is enthused at the prospect, and indicated Ireland could be an ally for the US in Europe, no matter how long Mr Kenny remains. After all, the UK is consumed with Brexit, France is France, and Mr Trump has expressed little love for Mrs Merkel. "I think the president is obviously familiar with Ireland, and I think the emphasis for any trip [to Ireland] will be on strengthening the bonds between our two countries, and our bilateral arrangements," Mr Spicer told the Irish Independent. "I know the president is excited to go do it. "It's a special relationship, and important to us going forward. "I think the Taoiseach has done a phenomenal job with the economy in Ireland, with so many more people working, and I think he's going to end on an extremely high note, and we look forward to meeting with whoever the Irish people choose as his successor," he added. According to yesterday's 'New York Times', Mr Kenny used the day "to lecture" Mr Trump on immigration. That was overstating it, but it is clear he established a rapport. That will be of limited use, given the expectation Mr Kenny will step down in April. "We don't see him as that (a 'lame duck' taoiseach)," Mr Spicer said. "There'll probably be tons of them (leaders in similar positions coming to the White House)." An administration with an uncertain future was always unlikely to phase him. Mr Spicer said no plans have yet been made but he hoped that Mr Trump could visit "beautiful areas beyond Dublin, like Kilkenny or Cork where my family is from...And meet some people too". Plenty will want to meet him, for sure. We predict more chaos. Nancy Benac, Chad Day, Eric Tucker and Michael Balsamo US president Donald Trump has struck a defiant tone after celebrating the release of the Mueller report as "a good day". Shane Harris President Donald Trump pushed for obtaining rival Hillary Clinton's private emails and his campaign was in touch with allies who were pursuing them, according to the special counsel's report.